Thanks to the wonders of modern-day technology, you can have a video chat with anyone you like, from anywhere in the world, using only your phone. It's usually free of charge too - apart from the money you're already paying for your internet connection to begin with. There are tons of apps on Android and iOS that will connect you with a contact of your choice, but some are better than others, and that's why we've pulled together this list of our top tools. They all offer reliable performance, bundles of features, and easy setup. FaceTime is a great choice for video calling friends and family - provided of course that all the people you want to talk to have an iPhone, iPad, or Mac to hand. There's no FaceTime app for Android (or indeed for Windows), and we wouldn't expect one to ever show up. If you meet the criteria of having an Apple device, FaceTime is very easy to use and includes call waiting (so you can put a second call on hold if you're already chatting). You can get Siri to make your calls too, by saying "hey Siri, FaceTime..." followed by a name. Thanks to iOS 11, you can now take screenshots and Live Photos on a FaceTime call, but the app isn't without its limitations - we've already mentioned the iOS and macOS-only aspect, but FaceTime is also just one-to-one, and group video calling isn't supported. Google Duo is pretty much Google's answer to FaceTime, though it's only been with us since 2016. During its short history it's been focusing on providing a slick and stable experience rather than adding bucketloads of features that you don't really need. Like FaceTime, the app integrates tightly with the rest of your (Android or iOS) phone, and picking out one of your contacts to make a call to is a breeze. Also like FaceTime, you're limited to making calls to one person at a time - there's no option for group video calls. One neat feature is the way you can see a video preview of a caller as the call is coming in, and Google says it uses a clever compression algorithm to make sure video and audio quality stands up even when you're on a weak (3G) connection rather than Wi-Fi or 4G. Facebook's decision to spin out Messenger into a separate app was a very smart one in retrospect, and Messenger is now one of the most capable communication apps out there - you can use it without the clutter of the News Feed and everything else Facebook offers. Unlike FaceTime and Google Duo, you get text messaging and photo sharing built in, plus all kinds of crazy stickers and effects to apply to your face if your regular look just isn't cutting it. You can make video (or audio) calls to anyone else who has Messenger installed. It has the advantage over the apps from Apple and Google in letting you add up to 50 people in a video call (if you have that many friends). On the downside, it does feel more cluttered and bloated in use than the streamlined Apple FaceTime and Google Duo. 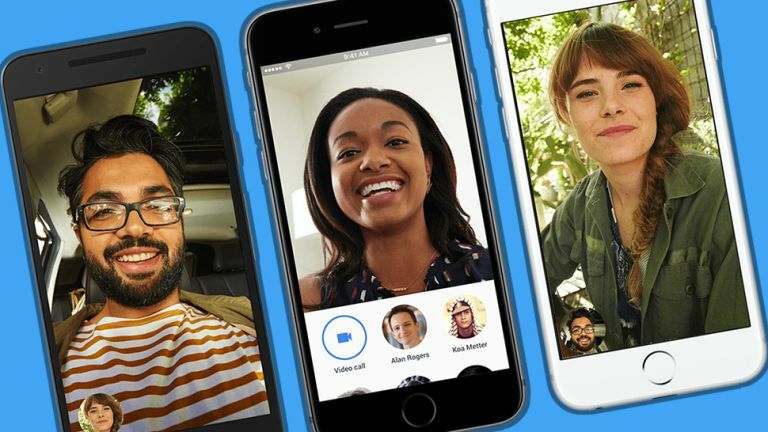 The veteran of the video calling apps, and still going strong thanks to Microsoft, Skype offers just about everything you could want from a video chat app, plus lots of extras - like the ability to call regular phone lines, if you're prepared to pay extra for the privilege. As far as video calling goes, you can make one-to-one or group calls for free, and you can usually rely on Skype to make the most of your internet connection, no matter your bandwidth. Adding to the appeal are the matching desktop apps for Windows and macOS. Skype is also trying to move with the times by packing in piles of instant messaging features as well, so you can send stickers and GIFs to your contacts, and put together "highlights" from your day that match the Stories feature in Snapchat and other apps. Since the launch of Duo, Google seems to be mainly targeting business users with the older Hangouts app, but it remains a quality option for anyone really. Unlike Duo, you can call multiple people for free, and it still fits right into Gmail and other Google services. There's also a standalone version of Hangouts on the web, which you might never have come across, so it scores points for being available on just about any platform you or your contacts are likely to use. It's also earned a reputation for being reliable and stable to use. You do need a Google account to use Hangouts, so it might not suit everyone, but it's got a lot going for it. Hangouts includes a lot of added extras too, including text-based instant messaging, stickers, and support for calling regular phone numbers, for an extra cost. Many a social media app has a video calling component tacked on to it these days, and we don't have space to mention them all here. We will mention Snapchat though, as you might not have realised the disappearing photo app can be used to make video calls. Only one-to-one video calls are supported, and you can start one by tapping on a friend's name and then the video call button. You can apply lenses, switch between cameras, and even minimize the call to a smaller window while you carry on using Snapchat as normal. Of course Snapchat gives you all that other social media goodness as well: text-based chats with one friend or groups of friends, disappearing photos and videos, the Snap Map to see where your contacts are, the Stories page to recap the last 24 hours, and so on.